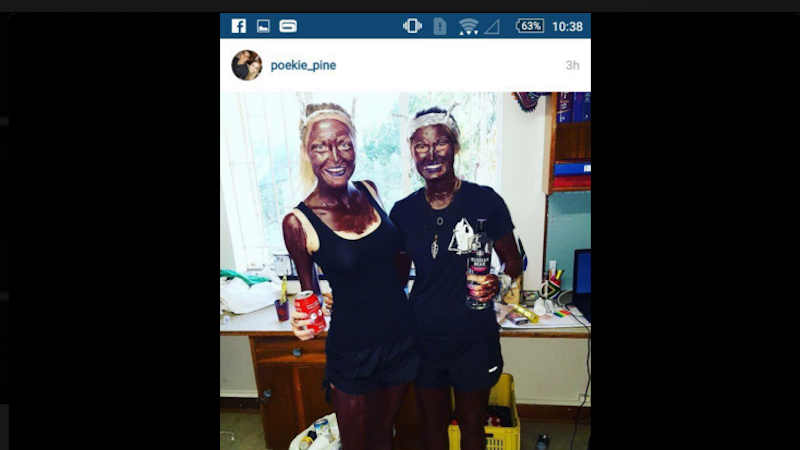 Two white students at South Africa’s Stellenbosch University have been suspended for appearing in what looks like blackface in a photo. Now, one of them claims the face paint was actually a dark purple hue. Poekie Briedenhann says she and another student were dressed like space aliens and that the face paint they’re wearing was purple, the Associated Press reports. Easy mistake: Black is pretty close to purple. Avoiding a racist mix-up by skipping dark paint altogether would’ve been another cool option. Here are unconfirmed photos of the pair that show them wearing foil antennas on their heads as part of their costumes. This purported blackface follows a previous incident at the university in 2014, when two students wore blackface to dress like Serena and Venus Williams. The episode at Stellenbosch University comes amid heightened debate on social media about racism in South Africa, which became a multi-racial democracy after the end of white minority rule in 1994. University spokesman Martin Viljoen said Monday that the university is aware of “new evidence” — a reference to the account about alien costumes — and that an investigation is ongoing. UDDATE: Here’s a photo that wasn’t posted in the original version of this story—of one of the women wearing what appears to be lighter purple paint.